This topic contains 2 replies, has 2 voices, and was last updated by n0xew 1 year, 3 months ago. With update 1.1.0.0 comes the emulators support. As said in the update post, you must own a supporter key to unlock this feature. Now, what are all those options to configure your emulators ? 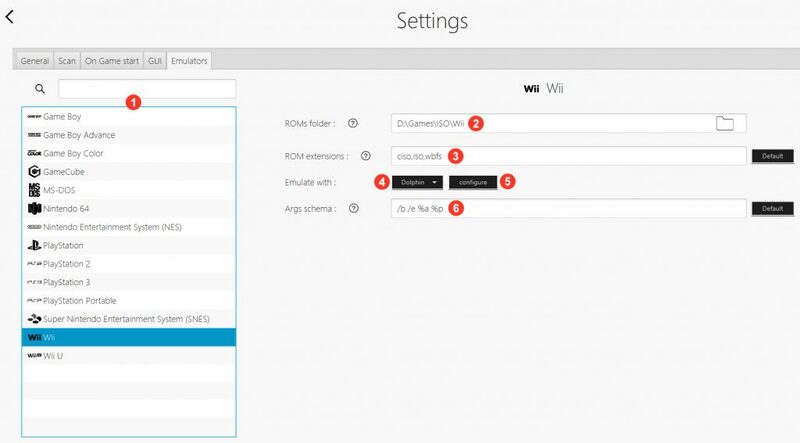 In order to understand how it works in GameRoom, let’s take a first look at the Settings menu. All red dots are explained afterwards. Here is a list of supported platforms in GameRoom. You can of course search them. Clicking on one of those entries will open the right pane, which is used to configure per platform settings. If you’d like to see more added, do not hesitate to suggest them here and please suggest an emulator associated ! This is not mandatory to start your games. But it can be really interesting to specify here the folder where your ROMs/ISOs/Files for games of this platform are located, as with a scan GameRoom will be able to add them to your “To Add” row, and fetch info about them. A little hint to have scraping work better, name your ROM file (or its direct parent directory) as the game’s name, “Mario Kart – Wii.iso” will ensure a good match when scraping. A comma separated list of extensions of ROMs for this platform. This is already filled by default, but you can of course edit it to add others that would have been forgotten. This is used to determined which file should be used to launch your game, and also to detect ROMs associated to this platform when GameRoom is scanning (see previous point). Mandatory to start your games, you will be asked to set one if you attempt to start a game whose platform’s emulator has not been selected. There are some well known emulators by default in this list, but you can of course suggest new ones here. Once set, you’ll never have to touch this dropdown again ! Mandatory. This opens a dialog just asking you to indicate where your emulator is installed. There is a default path set that is correct in some cases, but it’s better to check it yourself ! Also, this configuration is to be done only once per emulator, if an emulator is used for other platforms you will not need to configure its path again. Semi-mandatory. This part requires a small knowledge about command lines. Basically in order for GameRoom to start a ROM using an emulator, it needs to start this emulator using a command line, and specifying various options in it (mostly the ROM’s path). So here we have already preconfigured/default command lines (or arg schema) that will work for nearly all emulators (except RetroArch1, I will talk about it later). Basically, it will just take the args schema, replace in it %a by the game’s args2, %p by the ROM’s path. So here we can see that /b /e are just arguments for Dolphin (/b means that Dolphin will exit when the game is finished and /e is needed to execute your game). By making some researchs about Dolphin CLI, you’ll now be able to customize how your ROMs are loaded and executed! This example with Dolphin works for all emmulators; there are in this args schema some options for the emulator, and always %a , %p that GameRoom will replace at runtime ! Open RetroArch and download a core you’d like to use to emulate your games for a specific platform. Remember the name of the core. Open a file explorer and go to RetroArch’s folder and open the “core” folder. In it you should see multiple .dll files, find the one which name matches the core you have just downloaded. Go back in GameRoom, open the Emulators tab in Settings, select the platform (for which you have just downloaded a core for on RetroArch), and in “args schema” paste your path in place of "path/to/core". Keep the double quotes around it ! You can now start games using RetroArch for this platform. You’ll have to repeat the procedure for any other platform to emulate with RetroArch ! 2Game’s args: should be empty by default. In order to set it you must have “Advanced mode” checked in Genereal Settings, and then edit your game to specify some args. It’s rarely useful to that for ROMs though ! So here it is, after those 5-10mn of configuration you will never need to go back to this settings panel, and you can plainly enjoy playing games from other platforms with just one click on GameRoom ! This topic was modified 1 year, 5 months ago by n0xew. Hey, I need some help on my ePSXe emulator and the args schema, it just doesn’t work.